Kelly grew up in Sudbury, Ontario and is married to her best friend, Ron. She is a mother of 4, a grandmother of 13 and has worked as a Career Development Practitioner in the role of Employment Counsellor for more than 15 years. As in her place of employment, Kelly has a passion to come along side individuals in the church, help them identify their unique gifts and encourage them to fully embrace all that God has for them. It is her desire to work with other leaders to equip the saints for the work of the ministry. In her 30 years of serving in the church, Kelly has held various leadership positions and has taught accredited courses through Christian Leadership University. Her involvement as a Board of Director and Elder has given her valuable insight in church governance. Kelly is an ordained minister with Elim Fellowship Canada. Kelly has a strong prophetic anointing and a heart to teach, mentor and release those with similar callings. She loves to worship the Lord and, together with her husband, they co-write music. In her spare time you can find Kelly reading a good book or watching a movie just to kick back and relax! 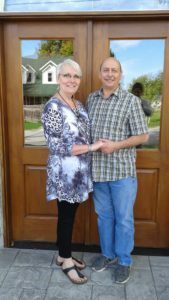 Kelly’s husband, Ron, is involved in worship and is the Technical Director at CityGate. His dreams and vision for this ministry is rather mind blowing! Ron is doing an excellent job mentoring those in sound and the technical set up.